What roles do nouns play in sentences? How can we figure out those roles when they get moved around? In this episode, we talk about case: how nouns get case, how it explains why some sentences are okay and others not, and how it can even help account for different word orders between languages. Passive sentences, like the one in (1b), have a couple of characteristics that set them apart from your average active, transitive sentence (1a). For one, the object of the active version gets ‘promoted’ up into the subject position. Moreover, the original subject gets ‘demoted’ down into a prepositional phrase. 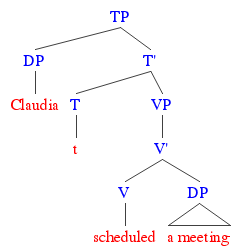 (1a) Claudia scheduled a meeting. (1b) A meeting was scheduled by Claudia. In fact, the agent of the action isn’t even absolutely necessary, since it can be dropped altogether without really affecting the sentence. (2) A meeting was scheduled. That passive auxiliary verb alters the sentence just enough so that the main verb no longer needs an agent. Since all English sentences still need a subject of some kind, the object becomes the only viable option, and so it moves up. What’s unusual is that there’s actually another way to solve the problem of subjectless sentences: dummy pronouns. In sentences like (3) below, that “it” doesn’t really refer to anything; it’s just there to make sure things don’t seem too empty at the start. (3) It seems Claudia scheduled a meeting. But if we can comfortably say something like (3), why can’t we build passive sentences in the same way, with a dummy pronoun in place of either an agent or an object? (4) *It was scheduled a meeting. With the ideas we presented in our episode on case, we now have a possible solution to this otherwise random quirk of English. If we suppose that, on top of eliminating the verb’s need for an agent, the passive voice also prevents accusative case from being assigned, we can understand why the object needs to move. If it’s really true that, in general, all noun phrases need case to make it into the final cut of a sentence, it makes sense that the object needs to go somewhere to get it. If passive verbs can’t ever have accusative objects, the only chance they have to survive is by going somewhere else — somewhere where they can get, say, nominative case instead. And the same underlying idea can extend to so-called unaccusative verbs, like “fall” and “appear.” In these cases, we have verbs with subjects that look more like objects than agents. In (5), neither “the disguise” nor “clouds” can really be said to be doing anything. In each case, it’s more like something is happening to them (because of gravity, or wind, et cetera). (5a) The disguise fell off. (5b) Clouds appeared on the horizon. (6a) *Elizabeth fell the disguise. (6b) *Something appeared the clouds. So, we can suppose that the subjects of these kinds of verbs start life off as objects (because they definitely aren’t agents of any kind), and then move up out of the verb phrase, becoming subjects. Like passive verbs, these unaccusative verbs can’t assign case to anything that follows them. Their objects are forced to look for case somewhere else. In exploring the syntax of passives and unaccusatives, we find even more reasons to think that case plays a major role in determining the forms sentences take. And with case, we gain an even better understanding of why these structures work the way they do. So how about it? What do you all think? Let us know below, and we’ll be happy to talk with you about case and different sorts of verbs. There’s a lot of interesting stuff to say, and we want to hear what interests you! The Right Type Coming soon!